I love your new moth friend. You must being wearing the secret moth pheromone scented nail polish. The bug is a little disconcerting. AWWWW thats awesome! I think it likes your polish! What shade are you wearing? Wow gorgeous pics Scrangie! And what polish are you wearing? Cacauate, look at his little face, he's sooooo cuttttteee!! Phyrra, lol :D I'm really not sure, actually! Some sort of really colorful moth, I've never seen one before! How adorable! I always think moths are more interesting than people give them credit for. 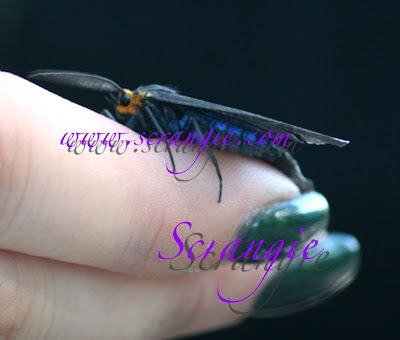 What a gorgeous boy ... probably a Ctenucha virginica. All the Lepidopterans (butterflies and moths) are out in force in my area as well. Thanks for the lovely pics. Oh awesome! I love moths they're sooo cool (and cute!)... I did a search and I believe he may be a Virginia Ctenucha. Definitely a male 'cause of the large, feathery antennae (sorry - I'm a zoology grad!). Oh, and your mani is great, too! Awwww....you must be the Moth whisperer! Now I want to do a moth matching mani! He's so cool! Did you name him? Man, oh man, I've got a few polishes that require 8 million coats, too. Gotta be worth the effort, tho! Wonderful photos. I love close encounters with nature like this. That is a stunning picture! Cute!! I work 2nd. shift so I see more moths than the average person. They are really unique and a lot of them look so fuzzy! This is cute, haha. I love how he matches your nails. What is your little friend's name? I love the fact that your np matches. 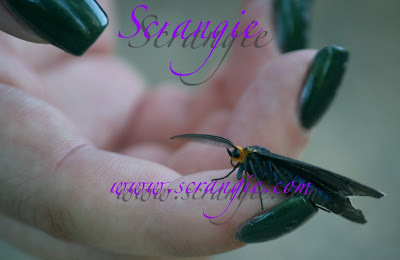 I hate insects(they give me the heebie jeebies) but that IS a gorgeous polish..! I wish I liked moths, but I gotta admit this one is pretty. Also LOL @ MOTD... Moth of the Day huh? I love insects! Your moth friend is beautiful! How in the world did you get it to stay for the pic? Ooh, do you like moths too? I adore them :) It's past lepidoptera season here, and I moved into a better-sealed house this summer, so I didn't have nearly as many friends flocking to my computer screen as usual. I also love your friend. Who will be next?